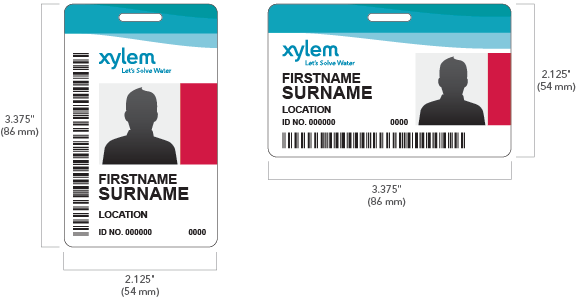 Employee Badges | Xylem Inc. In order to ensure the security of our personnel and facilities, all employees and visitors should be issued an identification badge. Consistent size and placement of vital information, such as photo, name, barcode or ID number, will ensure a quick and easy read of the data. 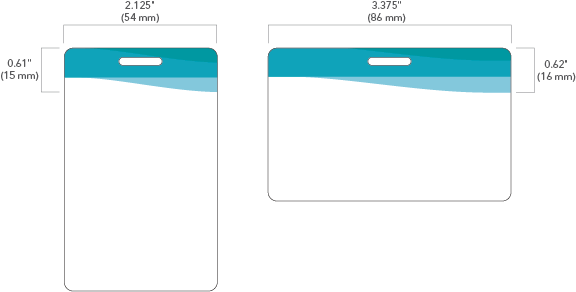 Badges are either horizontal or vertical in format and measure 3.375 inches (86 mm) by 2.125 inches (54 mm). Several elements combine to create consistent and effective badge design. 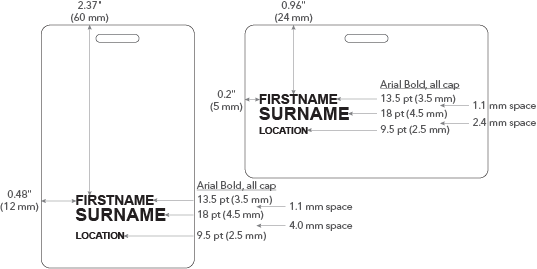 Size, placement, and other specifications for each badge element are described in detail below. The wave graphic is placed at the top of each badge so that it bleeds off three sides of the badge. Files are provided in jpeg and PDF formats at the correct size for both horizontal and vertical badges. A 1 inch (25 mm) wide Xylem logo is placed below the wave graphic at the location indicated in the diagram. The color logo with tagline is provided in jpeg and PDF formats at the correct size. Do not use product logos on the badge. Photos should be taken with a white or neutral colored background. Place photos at the location indicated in the diagram. 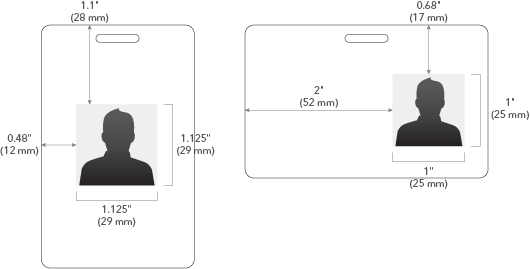 On vertical badges, the photo measures 1.125 inches (29 mm) wide by 1.125 inches (29 mm) high. 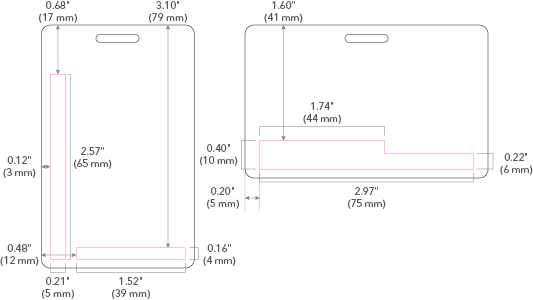 On horizontal badges, it is 1 inch (25 mm) by 1 inch (25 mm). Arial Bold is used for all variable information, including name, location and any identification numbers. Input employee name and location in black in all capital letters in the size and place indicated on the diagram. The areas outlined in magenta on the diagram below are reserved for any additional required identifying information such as ID numbers or barcodes. Text placed in these areas should be Arial Bold 8 pt (2 mm). Colored bars on the side of the photo distinguish different categories of badges. The bar should be the same height as the photo and align to the right side. The color bleeds off the right side of the badge. Badges for traditional Xylem employees have no color bar. If you issue photo badges to visitors, the color bar should be red. Contract or temporary employee badges are orange. For locations that process U.S. ITAR information, yellow is used for U.S. persons, and green indicates foreign national status. PANTONE color matches and their corresponding breakdowns are listed below. RGB 229/114/0Contract employees are those who have been hired as a Xylem employee on a temporary basis. Contract badges should be issued to temporary employees who have passed the denied party screening process. Photo required. RGB 255/221/0U.S. 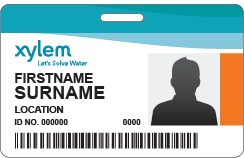 person badges should be issued to those who are regular visitors to a Xylem facility that follows ITAR regulations. The company of the regular visitor will provide written verification of the U.S. person status. Visitors must complete the visitor log upon entry and departure, and return the assigned visitor badge before exiting the facility. Photo not required. RGB 0/154/68Foreign national visitor badges should be issued to visitors who request entry to a Xylem facility that follows ITAR regulations. Visitors with this status must have completed the Foreign National Badge Request process, and have been approved. Badges should be issued after the receptionist has performed denied party screening upon entry. Visitors must complete the visitor log upon entry and departure, and return the assigned visitor badge before exiting the facility. Photo not required. Xylem employee badges should be issued to regular employees by the local Human Resources department. Employees must pass the denied party screening process. Photo required. NOTE: All of the colors chosen to differentiate badges, with the exception of yellow, are from the Xylem color palettes. Yellow is specified for badge use only. It is not to be used in any other Xylem application.